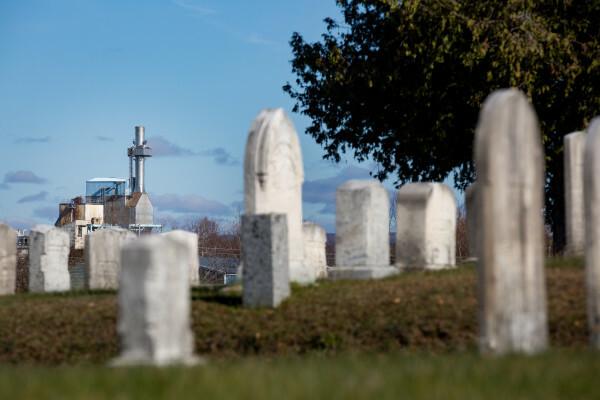 The Lincoln Paper and Tissue mill, as seen from the town cemetery. As part of the plan to make America great again, President-elect Donald Trump promised to bring back jobs. How? “Trade reform, and the negotiation of great trade deals, is the quickest way to bring our jobs back,” Trump said at a steel manufacturing facility in Pittsburgh. But clearly the issue is more complicated. The BDN recently took a close look at one sector — logging — to show the interconnectedness of an industry based on the manufacture of goods. — The paper industry contracted, in part, because there is less demand for many types of paper. Less demand lowered the price of wood. — It became cheaper to manufacture paper elsewhere, which is why more paper is produced in China and Southeast Asia than ever before. When mills shut down, loggers had to pay truckers more to haul wood farther. — Developments in technology meant that fewer workers were needed to harvest more wood. What was good for production was bad for jobs. While there are far fewer loggers, the amount of wood cut in Maine has increased, to 5.4 million cords in 2011, up from 5 million cords in 1970. Technological advances, not bad trade agreements, cut sharply into the number of jobs. “If we lower our taxes, remove destructive regulations, unleash the vast treasure of American energy, and negotiate trade deals that put America first, then there is no limit to the number of jobs we can create and the amount of prosperity we can unleash,” Trump said at the New York Economic Club in Manhattan in September. Unless he’d like to get rid of computers, there is a limit to the number of jobs that can be created in the manufacturing sector. The height of American manufacturing jobs was in 1979, and many of the jobs that existed then don’t exist now because machines can do them. People inside and outside of the industry have suggested short-term fixes for logging and manufacturing, but many aren’t viable. Some have said Canadians are stealing Mainers’ jobs through the bonded labor program, but the complaint doesn’t hold merit. Only about 40 people are logging in Maine through the program right now, said Dana Doran, president of the Professional Logging Contractors of Maine. Others have suggested that loggers across the state organize, perhaps in the form of a union, to work fewer hours. But unionizing wouldn’t improve the market for wood (by increasing prices) because loggers are already working fewer hours. Landowners are trying their best to spread out the work, so loggers still have enough to stay in business, sometimes cutting down to fewer days a week. In the absence of solutions, given global economic forces, it’s likely the couple thousand loggers left in Maine will go different directions. Artisan loggers will likely continue to make a living as long as there are smaller tracts of land with owners who value their work. They’ll probably do work other than logging on the side. Others will continue to be employed by large landowners using mechanized equipment. But if land changes hands and old contracts get ripped up, and loggers can’t make payments on their equipment, they may find themselves needing to seek a job in a new field. What they don’t need is someone like Trump making promises he can’t keep.